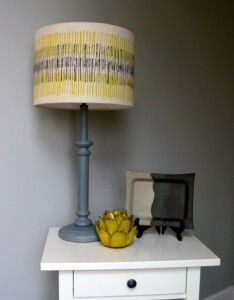 Handprinted Lampshade Workshop with Caron Ironside. Have a fun and creative day developing your own hand printed design and printing it onto a cotton/linen fabric and use it to make a completely individual and unique lampshade (30cm diameter drum shade). Suitable for beginners and those with some experience, includes two simple handprinting techniques. Cost: £45 -Including all materials. Based in Perthshire Caron set up as a textile designer in 2013 having recently finished studying textile design at Dundee College, and after choosing the creative industries as a second career. Working primarily in textiles, Caron prefers the appeal of hand drawn designs using pen and ink and welcomes the irregularities which appear in her patterns, whilst enjoying the clean crisp finish which comes with hand screen printing. Choosing to print onto unbleached linen union and cotton fabrics her designs are used to create lampshades and cushions, which both complement modern rustic interiors as well as stand alone as a feature piece. Her use of colour and pattern is simple yet striking resulting in a modern yet timeless design. The current homewares and accessories produced by Caron Ironside Design are inspired by mid century designs and motifs, notably from the 1950’s and encompass ‘retro’ in a fresh and contemporary style, although inspiration comes from all different sources. Caron sources quality raw materials and supplies from within the UK.